getting an exclusive new look at the hottest products coming to market. Every day we'll be bringing you highlights from our time on the range. Today's comes to you courtesy of Nighthawk Custom and pistol designer extraordinaire Richard Heinie. 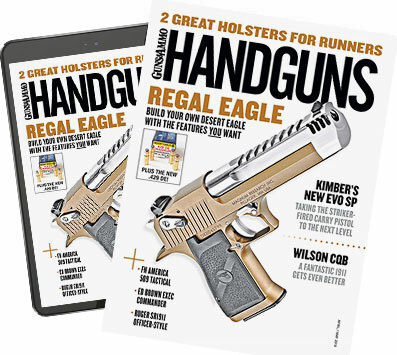 This past winter and spring, while working on Handguns TV, it was my pleasure to get to shoot a number of guns from Nighthawk Custom, and the one I liked the best was the Lady Hawk. Designed by Richard Heinie, he of Heinie sights fame, the gun is basically a slimmed down 1911 meant to fit smaller hands—women, junior shooters and people like me. It's been a runaway success. Funny story from CEO Craig Gholson, who presented today, is that guys would buy these guns "for their wives," and at least for the non-shooting wives, the second she would stash the gun in the safe and more or less leave it there, the husband would adopt it as his new carry gun. Great gun-buying strategy, if you ask me. Also funny is that the male buyers started asking if Nighthawk would build a Lady Hawk but not put "Lady Hawk" on the slide. Why? Because some guys find it embarrassing to have that on the gun once they start using it. Me, I think it's a cool name—maybe I always had a soft spot for the 1985 movie of the same name starring Mathew Broderick, Rutger Hauer and the ravishing Michelle Pfeiffer. But I digress. The Lady Hawk is chock full of features. Heinie thinned the mainspring housing and frontstrap, but he found that once the frontstrap was thinned to his satisfaction, it was difficult to checker. So he came up with his Signature Scallop, which is as functional as it is good-looking. The resulting grip circumference is just .065 inch larger than a Springfield EMP. Other features include Ultra-Thin Alumagrips, and Heinie magazine release, tool steel hammer and sear and Slant-Pro Straight Eight nigh sights. The mag well is contoured for carry. It will come in carbon steel, stainless steel or aluminum frame. I hope they keep the name, at least long enough for me to save up enough cash to buy one—for my wife, of course. At $3,000, that'll take a while.